Beautify CNMI! : Sunday Morning Activities and New Friends! Beautify CNMI! welcomed several new members to the coalition this weekend. 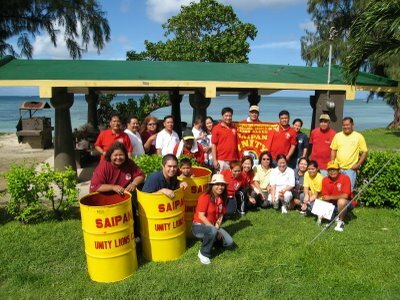 The Saipan Unity Lion's Club, which is already very active in the CNMI, invited us out to their beach cleanup between Quartermaster Road and the 13 Fishermen Memorial. 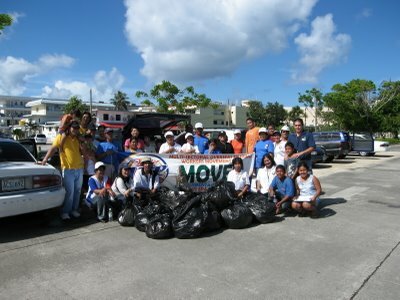 The 20 volunteers filled up about 12 bags with beach debris and left over picnic utensils. They also painted and donated 30 garbage bins, which they dispersed to beach side picnic sites around the island. The Lion's Club is coordinating with DNLR Parks & Recreation on the pickup and disposal of the trash disgarded in the bins. We also had another community cleanup in the Garapan Tourist District. We had help from our backbone volunteers from MOVER, Juanita Fajardo, Adam Sablan, Cinta Kaipat's Office, and the Kaipat kids, Jun, Josiah, Lelugh, Franklin, and AJ, as well as some newer friends from Kinpachi, the Japanese Association of the CNMI, and Tijuana Mexican Grille (go eat there!) In total there were 40 volunteers helping out in Garapan.